Thanks to RenewCanada I had the unique opportunity to attend the Strategy Institute’s conference on The Future of Canada’s Infrastructure. The two days started with a keynote address from the Assistant Chief planner of the Directorate for the Built Environment of the Scottish Government and the remainder was filled with presentations about the current practices of infrastructure across Canada. The conference was a good balance of case studies and the creative science behind projects including, the necessity of public engagement, how to make a project successful, what climate change is doing to our infrastructure and how to effectively manage existing infrastructure. The keynote address by Graeme Purves was brilliant and highlighted how climate change was affecting global infrastructure and then delved into some Scottish and UK examples. To set the priorities the Scottish government began with a framework, combining public perceptions with government priorities. In the end the government produced the National Planning Framework that highlighted the 14 essential projects that would benefit all Scottish residents; but Purves did state that at the at the municipal level the federal government was willing to engage in discussion about improving the local infrastructure, but that there would need to be a cost-sharing agreement. I think globally that is true that nationally infrastructure projects should be selected that benefit the country and at the regional and municipal level there can be cost-sharing agreements but that the entire infrastructure cost will not be borne by the national governments. My bf works in the digital marketing world so I get to learn a lot about the benefits from social media and public engagement from him. I believe that the engineering/public sector world is lagging in this area, but finally the trends of social media are catching on. From twitter to facebook to building a website that engages people to using mobile phones and including traditional public information sessions, all of these are essentials are key to capturing the greater audience for any infrastructure project. Three speakers discussed the importance of public engagement and social media. Kim Stephen’s the Program Director for the Water Sustainability Action Plan for BC weaved social media and public engagement through his presentation. Stephen’s didn’t mention specific social media programs in his presentation he did discuss the importance of them, including the website waterbalance.ca. Success did come from a ‘coffee table’ book, as Stephen’s described it, Living Water Smart that BC created to engage the public on the water crisis in BC. Cathie O’Toole the CFO of The Halifax Regional Municipality also spoke to the benefits of social media. The infrastructure of Halifax, like many other Canadian cities, is aging and failing. Halifax is looking to find a balance between priority projects and what is important to the public. Several presentations pointed to the post-war through the 60’s build of Canadian cities, which means that we are in a second phase of rehabilitation and rebuilding. With all this construction it is important to set your project up for success from its initial conception. Three ideas were discussed regarding this, Public Private Partnerships (P3s), How to Pick the right consultant, and how important planning is. P3’s are the standard now in BC says Sue Fimrite, Project Director of Partnerships BC, which is a subsidiary of the BC Ministry of Finance. From Design-Build all the way through including the management and operation BC has found was to mitigate construction and price risk through the use of P3s. The number of successes is immense but some of the hallmark projects include the Charles Jago Northern Sports Centre, The Sea-to-Sky Highway and the Abbotsford Regional Hospital and Cancer Centre. 3. Plan, Plan, Plan!! Jennifer Keesmaat a Partner of the Office for Urbanism gave a brilliant presentation on the necessity for planning. Perhaps I enjoyed this one most because of my love of engineering combined with all the knowledge I’ve gained from Phil about Marketing; presenting a plan for a major infrastructure project combines engineering with an effective presentation. Keesmaat drove home that projects are only successful with plans and the plans should be comprehensive, multi-disciplinary and collaborative. And the proof is in the case studies; all of the projects presented had success because they had well sought out plan. Climate change is a reality and we are all being forced to deal with it. It simply is not just about changing what we are doing going forward but mitigating what we have done in the past. “If you build it, they will come’ – made famous by the Phil Alden Robinson movie Field of Dreams. But once you build it make sure you keep track of it. It was some what of a shock to hear that municipalities were catching up on tracking the construction of the post-war boom still. From initial construction through maintenance some of the projects had no organized records. However, some municipalities were the opposite, acting proactively to plan for how to build maintenance programs for their functional, existing infrastructure. Colin Prang the Manager of Infrastructure Preservation for the City of Saskatoon. Saskatoon has been proactive with their pavements and has captured the notion of spending $1 at the right time and it saves you millions of dollars in the end. The focus for Mr. Prang is roads and he has set up an extensive evaluation system that rates pavements from very good to poor and from this he developed an extensive rehabilitation system to match his evaluation system. Saskatoon employs an extensive array of rehabilitation techniques from rut filling, to overlays, to complete reconstruction. Again the success of this program is its ability to effectively manage the existing road infrastructure and to be proactive with the restoration. Steve Dorey also spoke to effective management of existing infrastructure and how it relates to energy in Ontario. The Ontario government has committed to the elimination of coal fired plants by 2015. Dorey stated that this would be a success with a commitment to ‘green’ energy and nuclear (although given the most recent announcement about nuclear this seems impossible). In order to effectively make the switch it was necessary for an evaluation of the existing coal fired plants; how much energy are they producing, where is fed to but also what other energy infrastructure could Ontario rely on, local and foreign. Portland, Oregon: Known as one of the best US cities to live, Portland sent Karl Lisle, Sr. Planner, to talk about the success of a well planned city. Their slogan really sums it up well, “…we planned. it worked…’ Ultimately the goal for Portland is to have everything within a 20 minute walk or bike, aka twenty-minute neighbourhoods. As they continue with the city, Portland is expanding its cycling and public transportation routes. Lisle believes their strategy can be applied globally; Build a sustainable economy through job growth, prosperity and a sustainable way of life. Yellowknife, Northwest Territories: The Deputy Mayor Mark Heyck came to present. Before he opened his presentation he asked the audience if and when a more sustainable way of presenting would happen; the projectors consume a disproportionate share of heat and electricity. Yellowknife was named the most sustainable small city in Canada for 2008-9 by the Corporate Knight’s Magazine. Much like the twenty-minute community of Portland with a city of only 20,000 people Yellowknife is promoting a similar theme, have a compact city with easy access to biking and walking trails. Unfortunately unlike Portland, Yellowknife faces very harsh winters where people become much more car dependant. Windsor BIIG/DRIC: Dave Wresinski the Project Planning Division Administrator of the Michigan Department of transportation presented on the proposed new Detroit River crossing. 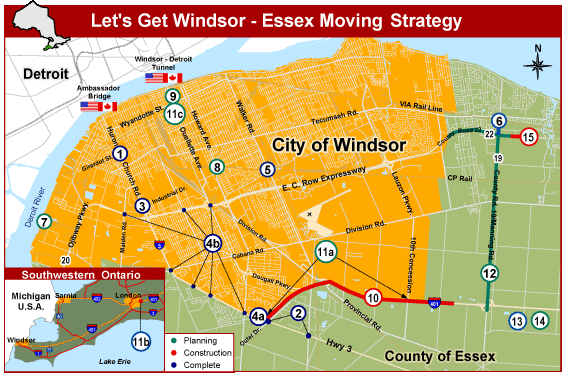 This is trans-national project that links Detroit and Windsor. With the Ambassador bridge reaching the end of its useful life and the tunnel unable to manage the capacity; jointly both the Canadian and American governments are investigating a new crossing. Without getting into too many details Wresinski discussed the challenges with the project including budgeting issues since two countries are involved and the fact that the current Ambassador bridge is privately owned and operated. Likely funding for this project will come for the private sector making this one of the first P3’s for Ontario. There was a lot of great information at the conference and over the coming weeks I’ll expand some of the information.